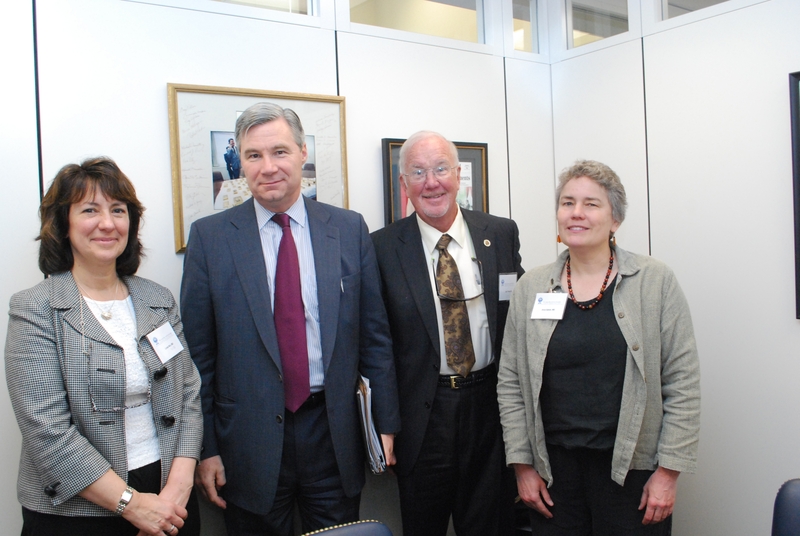 ATS member Linda Nici with Rhode Island Senator Sheldon Whitehouse and ATS member Dona Upson and PAR representative Carl Flately. In late March, ATS members from across the United States descended on Capitol Hill to advocate on behalf of patients with respiratory, critical care and sleep disorders, as well as clinicians, researchers and allied healthcare professionals who work in these fields. Although the ATS is engaged in a constant dialogue with Congress and the Obama Administration about a wide range of regulatory and funding issues, the ATS message to lawmakers on “Hill Day” was limited to four particularly timely concerns: the need to sustain our biomedical research investments through the National Institutes of Health (NIH) and VA Research Program budgets, protecting the Clean Air Act and taking action on COPD, which is the third leading cause of death in the U.S.
“With Congress in the midst of a heated discussion about federal spending, the Society’s message about preserving the NIH budget was both timely and forceful,” said Gary Ewart, senior director of ATS government relations, who attended “Hill Day” and coordinated visits to legislators offices. “Prior to visiting a number of congressional offices, James Kiley, PhD, director of the Division of Lung Diseases at the National Heart, Lung, and Blood Institute, gave ATS members an update on the advances the institute has made in lung disease research. ATS “Hill Day” participants sent a clear message to Congress about the importance of research to public health and, given the high cost of healthcare, the country’s economic well being. ATS members also educated members of Congress about the important biomedical research being conducted with funding from the VA Research program. In particular, the Society’s advocates urged Congress to provide the resources necessary for the VA to upgrade and improve its aging laboratory infrastructure. ATS members presented legislators with a recent study that showed $30 in economic savings–mostly from reduced healthcare expenditures– for every $1 spent on pollution control. Armed with this important information, the Society’s members urged Congress to reject any amendments to remove or delay the EPA’s authority under the Clean Air Act. Members also shared with senators and representatives important facts about COPD, which is affecting more Americans each year. They explained by it is vital that the federal government to pay attention to this often overlooked disease and to support the creation of a national NHLBI action plan that would respond to the growing COPD epidemic.